You can now eat the most important meal of the day at Ad Hoc. 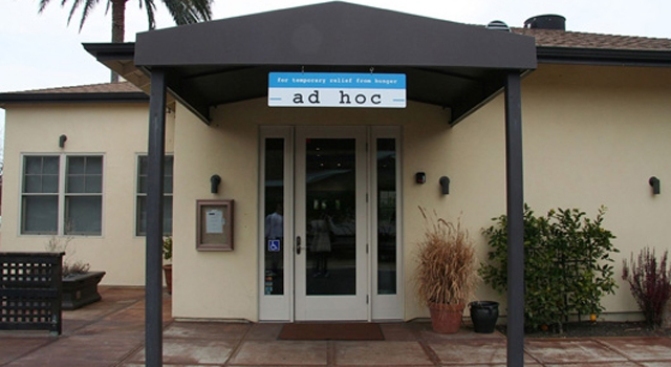 Yountville: Breaking hot off the wire, we have news that Thomas Keller will be rolling out breakfast service at Ad Hoc. The reason for the move is that Sir Keller thought the current brunch structure didn't reflect the entire idea of being "homey," which was you'll recall is the original idea behind Ad Hoc. So, seeing as how a) a three-course brunch isn't exactly what mom might make you and b) affordable comfort food selling these days, GM Nick Dedier and company have been quietly transitioning into a new, cheaper format more in tune with the homestyle Americana vibe. Here's the breakfast format: the price has been lowered to $24 and it will be available on Sundays from 10am to 1pm. Upon seating, guests are served the usual basket of Bouchon Bakery pastries and a yogurt parfait. Then, they are given their choice of waffles, oatmeal, corned beef hash or "the American breakfast" (two eggs any style, scallion potato cakes fatted calf breakfast sausage & slab bacon); there will also be one or two seasonal specials each week, natch (see sample menu below). Per TK, the choice of one breakfast entree is meant to evoke the nostalgia of childhood Sundays, you see? Eggs by Thomas Keller, everyone!